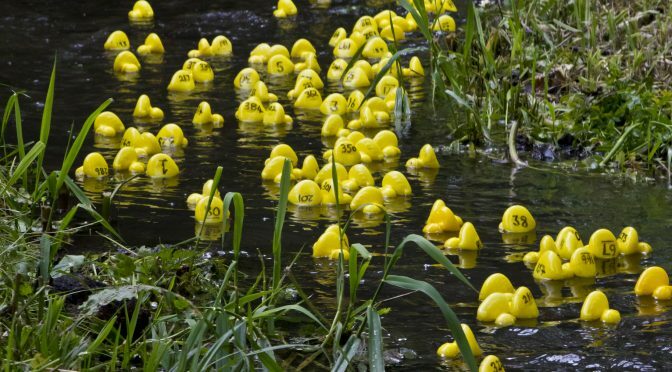 You would be Quackers to miss the 20th anniversary of the Storrington Village Duck Race! There is only one place to be on Sunday 13th May and that is at the 20th Storrington Village Duck Race which promises thrills and spills as the ducks race to glory alongside a great range of entertainment for all the family. Join us from midday on Sunday 13th May at Riverside Walk and Library Car Park to race ducks and raise money for the Friends of Storrington Primary School. There will more hotly contested races this year with 6 heats; the top ten ducks from each heat being entered into the Grand Finale, making 7 races in all. Ducks for each race are on sale now and can be bought in advance in the days leading up to the big day, or on the day itself from the many volunteers in the village. Prizes are on offer for each of the heats with Cash prizes available for the winning ducks in the Grand Finale. To add to the fun, there will be fun-fair rides and face-painting, craft stalls, music, bar, refreshments, ice-cream and cakes plus the ever popular BBQ. All proceeds from the Duck Race will go to Storrington Primary School to provide and maintain facilities and equipment for the children. The Duck Race team are still taking bookings for stands so if you have an idea for a stall or a craft business that you want to promote please get in touch with georgedelarue@hotmail.co.uk.